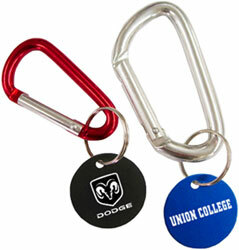 Medallion carabiners feature your choice of our very popular mini carabiner or large carabiner clip. The medallion is made from anodized aluminum and comes with a split ring for attaching to carabiner clip. Medallions have plenty of room for custom engraving of your name, logo or message on one or both sides! Blank medallion carabiners are also available. Carabiner imprint areas: small: 1.5" x 0.15"
Medallion Carabiner Keychains are Lowest Price Guaranteed! -Optional second side engraving: $0.25 ea. Our medallion carabiner keychains are perfect. The engraving on both the medallion and carabiner came out awesome. Also, the ordering process was quick and very easy. Thanks for all your help in making our reunion a big success! Optional second side engraving on medallion: Add $0.25 ea. One-time set-up charge (if side 2 differs from side 1): $25.